Register Now for Fifth Annual Scallop Search! 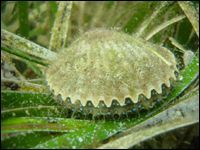 Help scientists monitor our population of bay scallops while having fun snorkeling in the seagrass flats. This boating event is open to motorboats, sailboats, and kayaks and an excellent activity for families. If you want to be a part of this event and don't have a boat, register and Sarasota Bay Watch will put you on a list for openings on registered boats, then call you prior to the event to inform you of availability. You will be provided with the instruction and tools for scallop counting but must bring your own mask, snorkel and fins. Weight belts are recommended. For questions please call Sarasota Bay Watch at (941) 953-5333 or (941) 232-2363.